I returned to watercolour painting in 2016, having dropped all painting about the turn of the millennium. 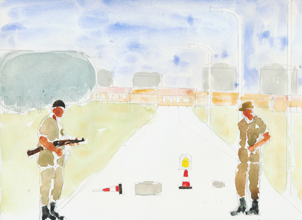 These watercolours continue my Men at work series, begun first with photomontage/collage, and continued with pen and collage. All the images are pulled from the internet. 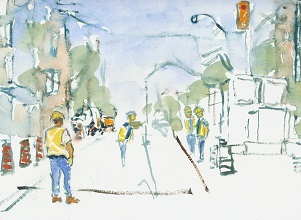 I have also done countless drawings at Princess Margaret Hospital, and recently took up plein air watercolour painting. 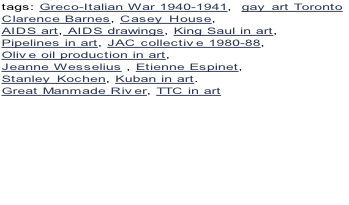 The Archive of the website covers work before 2000: my acrylic paintings drawings, and sculpture in wood. The Archive includes work done by the three-member JAC collective (1980s), as well as work by the two-man united artists (late 1980s). It also includes Clarence Barneâ€™s guestbook at Casey House 1995. 1980s)sculpture of united artists, Gerrard Pook and I (late 1980s), drawings at the height of the AIDS crisis (around 1990) .